JED HEATING AND COOLING, INC.. MEET THE OWNERS. James E. DeLattre is the founder and President of JED Heating Cooling, Inc. His experience in the HVAC Industry dates back to 1974. Jim graduated from California University of PA in January 1970. He also attended business management, engineering and sales excellence classes in the HVAC industry. 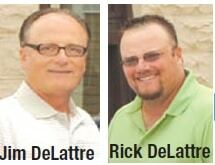 Richard J. DeLattre is the Vice President and Sales Manager of JED Heating & Cooling, Inc. Rick graduated from California University of PA in June 1994. In his early years in the business he was both a certified technician and installer. Rick has attended both residential and commercial design and engineering classes. In 1952 father Eugene J. DeLattre went into business bringing in a trainload of the first air conditioners in the Mon Valley to Donora, PA. His son, James DeLattre, started JED Heating and Cooling Inc. in 1979 concentrating on residential heating and air conditioning, light commercial, hot water heating, geo-thermal, heat pumps, and indoor air quality. Our original location was 400 Meldon Ave. In 1982 we relocated to 900 McKean Ave, to a new facility enabling JED to house more employees and warehouse more equipment. The 1980’s were good years for JED, doubling our service and installation capabilities. In 1993, Rick, James’ son, became partner in the business. With Rick coming into the business, and new growth, 900 McKean Ave became too small so JED relocated to our current location of 840 McKean Ave, gaining 18,000 square feet of capacity and employing 20 people. In 2004 we also opened a branch in Clairton, PA, enabling us to be able to better service the northern part of the Mon Valley and areas beyond.